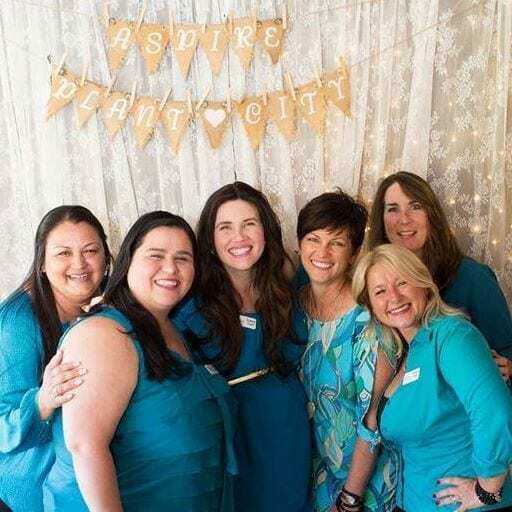 Aspire Plant City aimed to unite women throughout the community and create a space for their empowerment to flourish. A year later, the group had seen major successes and blossomed into one of the most active in town. Aspire is coming full circle this April as it holds its one year anniversary party in the same place it all began. More than a hundred women flocked to Wishing Well Barn last year to learn about the new women’s group and through the following months it proved just how much Plant City needed the niche organization. On April 23, the party continues at Wishing Well as the members open the doors to any women in town that may want to join the family. Little things may have been tweaked along the way, but the group has had a seamless year. It hosts three to five events a month and has had more than 40 events since its inauguration. Members know the women in this town all have different needs and desires so they structured a variety of events so everyone would have something they love. Whether it’s local business professionals getting together for a Power Hour lunch or a group of tight knit women participating in a book club, Aspire can fill the void. Their Coffee Collaborations and social evening activities tend to draw some of the larger crowds and Paat said the future holds even more unique opportunities for the group. The goal is to soon add a community service arm to the organization, connecting those who want to give back to local opportunities and organizations that are in need of assistance. It’s a passion she says has been in the hearts of the core members for quite some time and, while there are still a few things to work out. she hopes to see it make its way predominately into the organization this year. Though not mandatory, Aspire’s members frequently flock to the majority of the events. They love the group and many have begun crafting lasting relationships with their fellow members. The goal is to continue to welcome women in and Paat said they hope to always see new faces at their events. Though it’s only been a year, the impact Aspire has had on the lives of many of its members are slowly piling up. There are several off the top of her head that Paat said she knows have made life-changing decisions because they were able to plug into a group of women who support and champion them through life. The quick growth of the group caught even the board members by surprise. Every time they turned around there were new members flocking to be a part of the change Aspire was bringing. The sheer number of unique events they’re able to offer proves the vitality of the young organization and Paat said those are only going to continue to grow. They’ve also been able to channel their passion into helping small businesses and local organizations. They board is big on hosting events in locations many in town may not be familiar with so they can show off some of the hidden gems in Plant City. They’ve also benefited several local nonprofits already through the engagements and connections made. The board is currently comprised of Paat, Sophia Hyde, Alice Bullard, Lizzette Sarria, Michelle Welch and Irene Castillo. The hope is soon they can train new leaders in the group to step up and help it continue to evolve. When: 6 p.m. April 23. Where: Wishing Well Barn, 4302 Pippin Rd. For more information, visit the group’s Facebook page or go to aspireplantcity.org.